3D television and 3D cinema are becoming wide-spread, but 3D Virtual Reality goggles (or glasses), despite being a many decades old idea, are just (as of 2013) receiving increased attention. 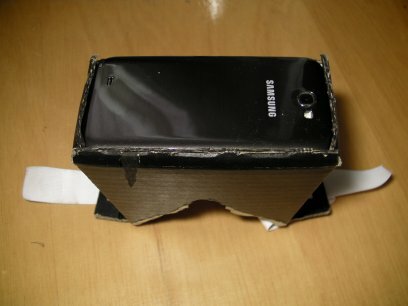 The few commercial devices available don't sell well, in parts due to price, but a cheap alternative has emerged: A modern SmartPhone, two lenses for under 10$ and some cardboard and glue is all you need to build your own 3D-VR goggles. There are already various DIY websites, but no single comprehensive one. This one is neither. It is mainly a list of resources I found useful, as of 2013, and my own experience in building one. How do 3D VR Goggles Work? The retina of each eye receives a 2D projection of the 3D world from slightly different perspectives, from which the brain reconstructs a 3D experience with illusion of depth. 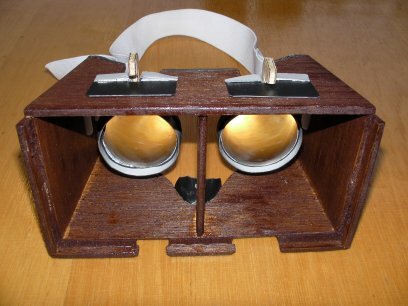 All stereoscopes provide two 2D images, one for each eye to create a 3D illusion. Normally, what you see depends on in which direction you look. 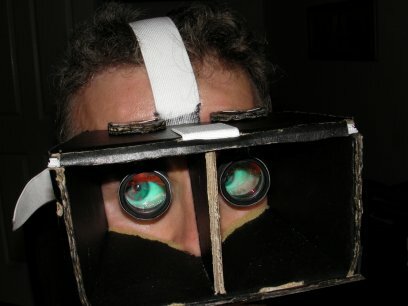 To achieve the same with VR goggles, the head orientation and location needs to be tracked and used to calculate what to display to the eyes. Most modern SmartPhones can do all that: Their display is large enough such that if held horizontally about 5cm from your eyes, the left/right eye can see the left/right half of the display. Since your eyes cannot focus to 5cm, you need to wear ultra-strong (+20 dioptre) "reading" glasses. Special Apps that shows two images side-by-side give 3D experience. The built-in sensors (gyroscope, magnetic compass, gravity sensor) can determine the orientation of the SmartPhone and hence your head. GPS and accelerometers can determine its location. print → lay on cardboard → poke corners with needle → mark lines on cardboard → cut → fold → glue. Foam: (optional) for covering edges for a more comfortable fit. Wide elastic band: Recycle from ski goggles or buy in haberdashery. Glue: super glue or wood glue or most others will do. Tools: scissors, knife or saw, pencil. 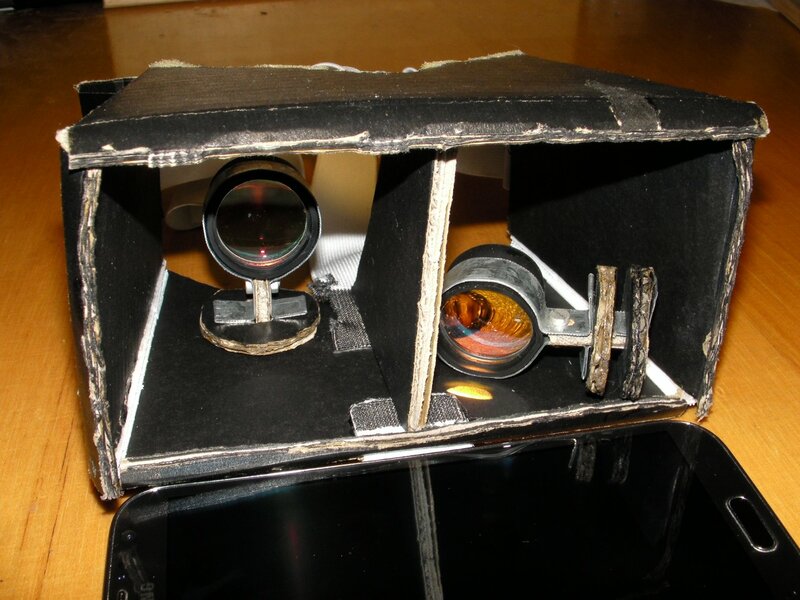 Unless otherwise noted, the DIY projects below convert a SmartPhone plus two lenses into 3D-VR goggles with a cardboard frame. OpenDive: + lenses adjustable but - not provided/specified, - requires 3D printer (~$1000) or service (~$50). GoShow: Cardboard and 3D-Print template for Samsung Galaxy S and Note series, + aspheric plastic lenses (Ø35mm,2x$10). 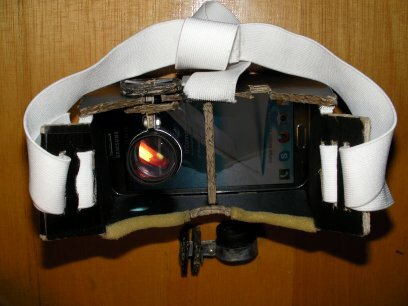 DIY Oculus Rift: w/o SmartPhone based on separate components, connects to PC, +- Much more advanced project, more info. SmartPhone: You want (in decreasing order of relevance): a high-resolution display, ideally 5.5", low weight, wide viewing angle. The best phones in this category (as of 2013) seem to be the Samsung Galaxy S4 and Note3 with their high quality Full HD screens. Add a separating wall between left and right eye to prevent cross-viewing. 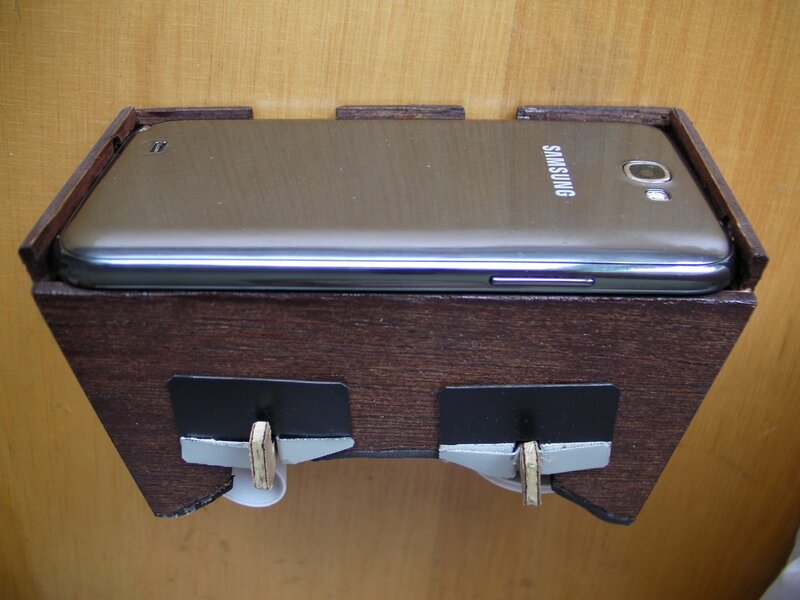 Use/design a frame where the SmartPhone is inserted from the top, not from the side, to prevent it from falling out. 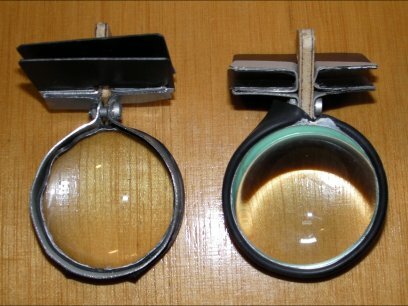 Use large aspheric lenses (see below for details). The more curved side of the lens should face the display, the flatter side should face the eyes (if your lens is asymmetric). Make distance of lens to display and distance between lenses adjustable. Make distance between lenses larger/smaller than 6cm for screens smaller/larger than 5.5". If your eyes have no or only weak astigmatism, you should be able to adjust the lenses so that you don't need your glasses (if you have any). For the frame, use thick black sturdy cardboard e.g. empty boxes from your grocery, or 3mm plywood. Reinforce cardboard edges by putting some glue on them. Minimize gaps / infalling light. The ideal goggles are pitch black (when SmartPhone is switched off). In addition to normal goggle elastic band from side to side, use an extra one from top to back. Focal length should be about half the full display diameter, which is 50-70mm for most SmartPhones. Aspheric / Plano-Convex lens to minimize distortion. Light-weight, therefore lenses should not be too thick or large, but plastic scratches. A short(er) focal length results in a + wide(r) FOV and therefore + leads to a greater experience of immersion and a + more compact goggle design which is + more comfortable to wear. But it comes at a price: While a million pixel per eye sounds impressive, if scaled to fill out your whole FOV, - pixels become clearly visible. Furthermore - the lenses become harder to adjust, - need to be larger hence heavier, and - distortions at the boundary increase. To avoid disappointment I therefore recommend gaining experience with lenses of larger f before trying smaller f.
Most existing DIY frame templates can be adapted to accommodate most lenses. Jewellers magnifying glasses are too small, but if you use them, as the Refugio3D does, at least cut the plastic, since it limits your FOV. Equally important is that the lenses can be adjusted within the frame, which is not the case in various DIY designs. Even slight mis-alignments significantly reduce the quality of experience, strains the eyes, cause eye fatigue, headache, and/or nausea (more quickly). A static adjustment is quite unlikely to do the job. Adjustable lenses are imperative if the frame is used by different users or with different SmartPhones. An alternative to glasses is to wear contact lenses with about +20 dioptre (add/subtract your prescribed dioptres if you already wear contact lenses), which has some advantages: + maximal FOV, + lightweight, and + less distortion. Since non-central pixels of the display are farther away from the eye than central ones, they will appear - blurred, so this option is probably better put aside until spherical or flexible displays appear. - You also have to remove the contacts every time you take off the goggles. Oculus Rift: (2015, ~$300), primarily for MS-Windows games. 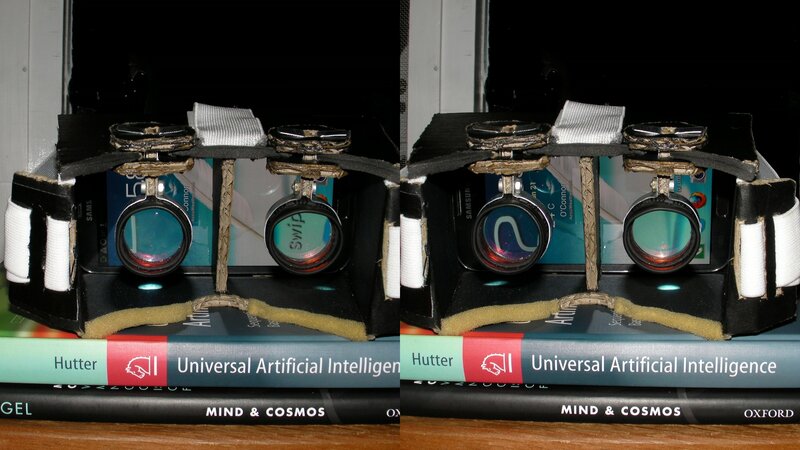 Below are some pictures of my own 3D-VR goggles for a Samsung Note II (- a bit heavy). I optimized for best 3D-VR experience achievable with a robust, cheap, flexible, and simple DIY design, rather than aesthetics. + The black 5mm thick cardboard from a grocery box is ideal. 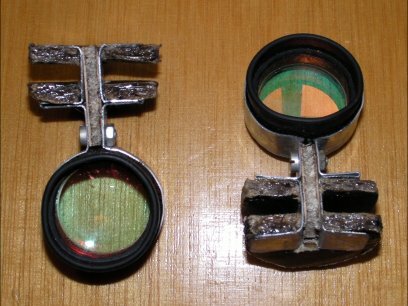 The lenses and eye cups are from two handy monocular telescopes (2×$4). I put the front lens into the ocular piece and widened the opening with nail scissors. - The lens diameter (25mm) is too small and their focal length (~80mm) a bit too large, + but quality is good and the rubber eye-cups ease eye alignment with small eye relief resulting in nearly full FOV. o The lens-holder works great but required cutting, bending, and drilling (thin) metal. ++ The lenses are independently adjustable, each in three directions: distance to display, distance between each other, and horizontal rotation. The photos below hopefully clarify the construction and mechanism. 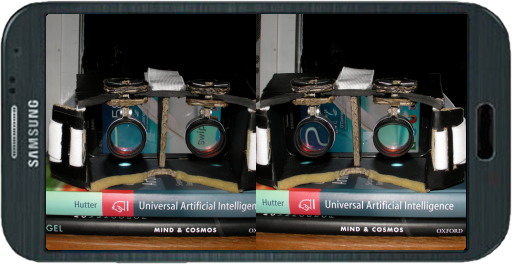 Improvement and simplification: For the lens, use a larger magnifying glass with handle, shift two punched cardboard disks over the handle, glue them on, and cut the handle shorter. This avoids having to cut, bend, and drill metal. Below are my second 3D-VR goggles out of - 4mm stained plywood, + larger but - heavier lenses (Ø40mm), +- shorter focal length (f50mm) + hence larger FOV. While the plywood construction looks better, the flexible cardboard frame is more functional. I recommendation a cardboard frame with lenses (Ø & f) somewhere in-between the extremes of these two goggles. You need software that splits the screen into two parts and displays two images, one for each eye. This is called Side-by-Side (SBS) view. To be 3D, the images for each eye need to be from slightly shifted perspectives. For true VR feeling, the software needs to track your head orientation using the SmartPhone's gyroscopes and/or other sensors, and update the view accordingly. The following list focusses on SBS 3D Android Apps with head-tracking. Most of them are just small but nice demos, but a surge of better Apps is to be expected for 2014/2015, or develop your own SBS App. Tablet Remote App lets you control the Android phone with another Android device via WiFi. snakebyte idroid:con (~$30) is a universal Bluetooth game controller. PCBTKeyboard can even convert your Laptop's keyboard to a BlueTooth Keyboard. 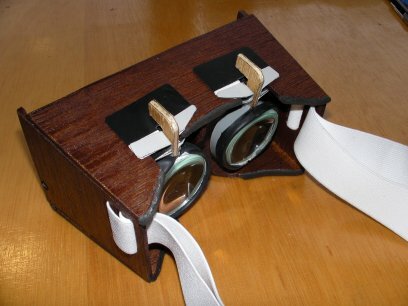 Adjustable FOV: Displaying a scene with a 30° FOV on a 3D-VR goggle with 60° FOV can cause distortion. VR software allows developers to set the FOV. Since different lenses and SmartPhone sizes result in different physical FOV, the user should be given the opportunity to set this parameter. 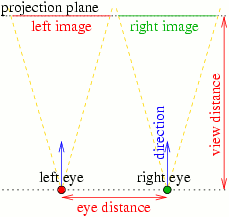 Adjustable Eye Distance: A point in 3D is projected to two 2D points on the screen, one for each eye. These two points should be about 6cm apart (eye distance) for 3D points at infinity. Since screen size and eye distance differ, the user should be able to adjust this parameter. It is remarkably easy and cheap to convert a modern SmartPhone into quality wide-FOV 3D-VR goggles with head tracking. Game console and PC games have been adapted for 3D-VR goggles, but many games could run directly on modern SmartPhones with their powerful processors, if one is content with older or slow games, and willing to wait for their adaptation or adapt them oneself. Building the device was as much fun as experiencing the SBS demo Apps, and Quake II is a real delight. I expect a surge of proper SBS Android Apps in 2014/2015.